A special thanks goes out to Krista at The Happy Housie for organizing today’s event! And welcome to those of you coming over from Place of My Taste! Both of my script chairs in the sitting room get plumped up with matching velvet pillows from Pottery Barn. I love the claret color and think I can use them during the Christmas season. 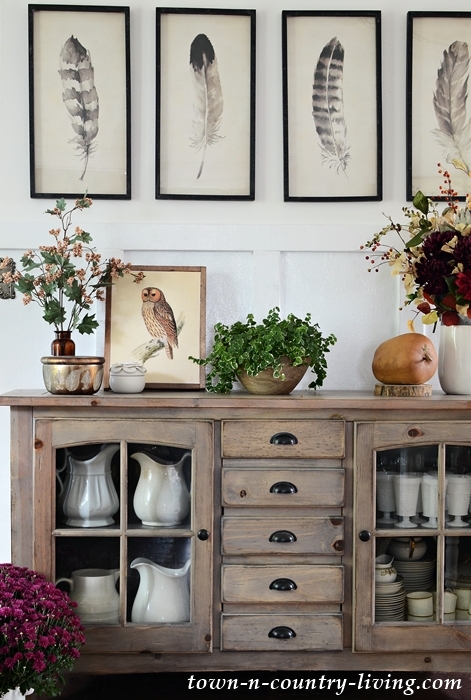 Of course, I have to include a few pieces of nature in my country style fall home tour. 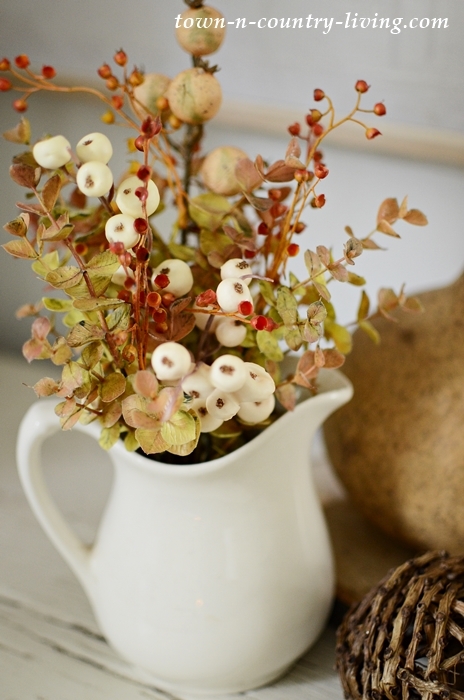 A couple of dried gourds join a bouquet of faux stems and berries tucked in a white ironstone pitcher. Additional color is provided by this fun little plant whose name I can’t remember. My brown vintage bottles always make an appearance this time of year. Leaves and berries complete the look. I still have my lidded mercury candle from Pottery Barn. It will probably take another year before it’s burned up – at which point I’ll still have the beautiful mercury-etched holder. A couple weeks ago I shared my fall mantel which was inspired by pink, copper, and burgundy candle holders – which were also the inspiration for most of my fall decor. Eventually I’ll replace the bamboo script mat in this room with a decorative rug. I struggle to find one large enough that doesn’t cost thousands of dollars. 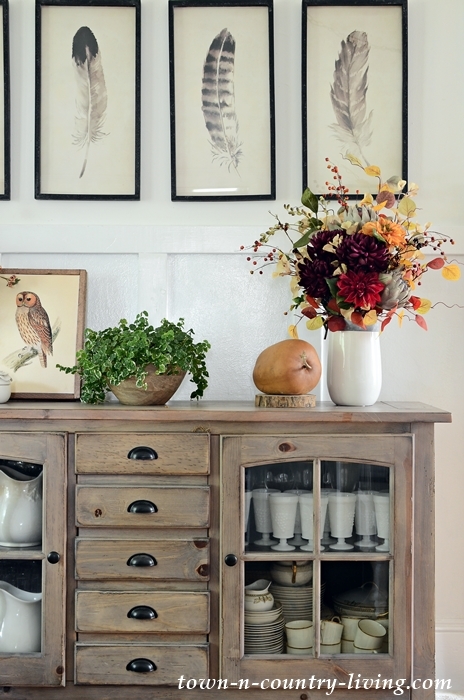 My favorite buffet gets dressed for fall with a framed owl printable and floral stems. Puddy stakes his claim on his favorite step. And somehow I’m managing to keep my topiary alive! 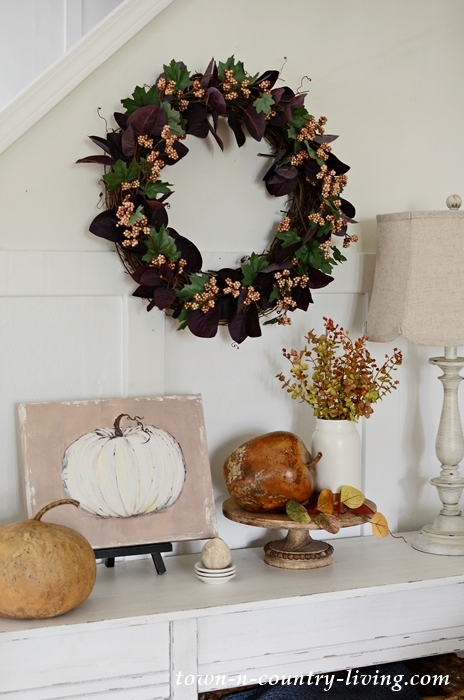 A couple weeks ago I shared instructions on how to make the fall berry grapevine wreath. 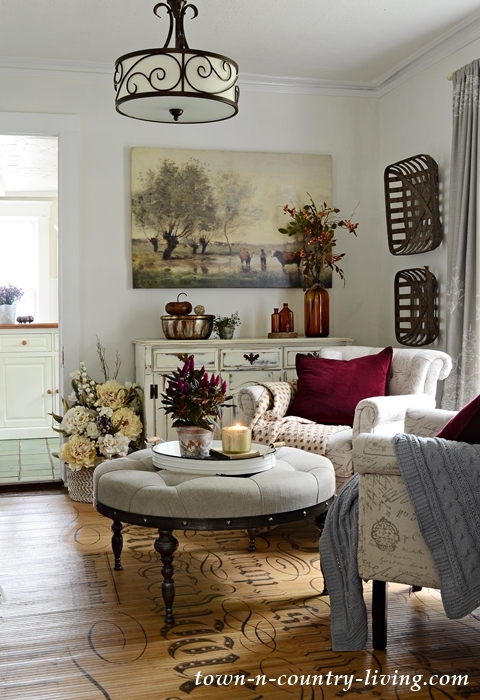 The family room gets a few touches of berry and purple tones for my country style fall home tour. Gray pillows and wine pillows in the family room are from Pottery Barn. 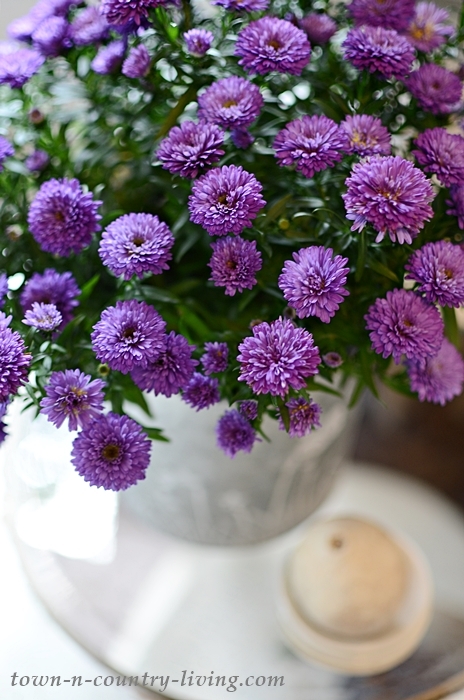 A pretty purple aster adds color on the end table. Such a sweet little flower that I’ll soon transplant outdoors so I can enjoy it for years to come! Soon I’ll share my kitchen and maybe my bathroom which we painted gray earlier this year. 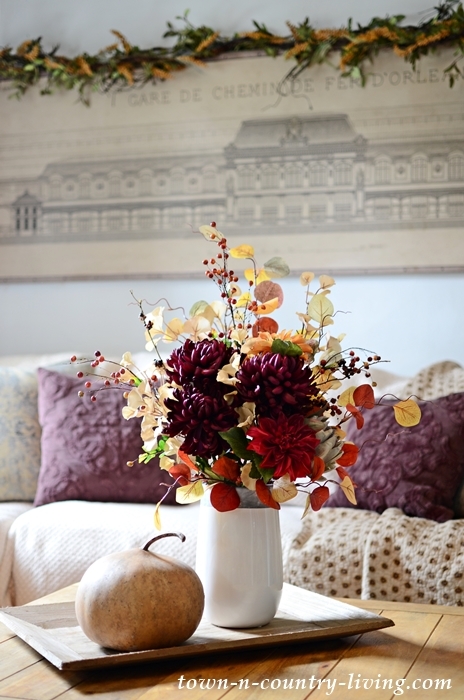 Next up on today’s tour is Lory from Designthusiam with her tips for fall decorating. This week’s fall home tours started yesterday and more are coming the rest of the week. You can find the published home tours below. Check back for added links throughout the week! 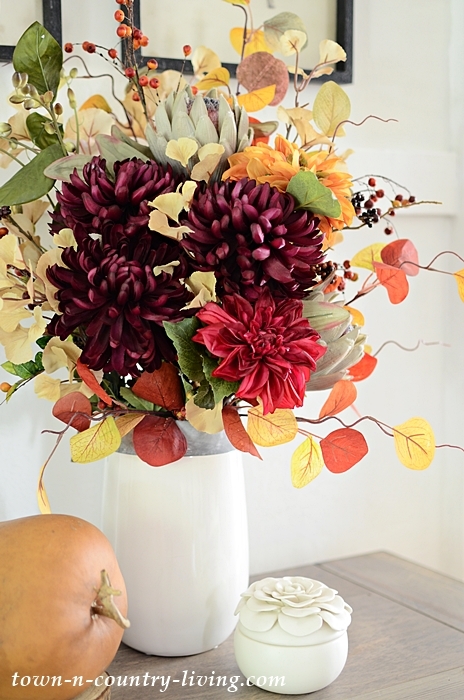 I love, love your fall decorating tips! 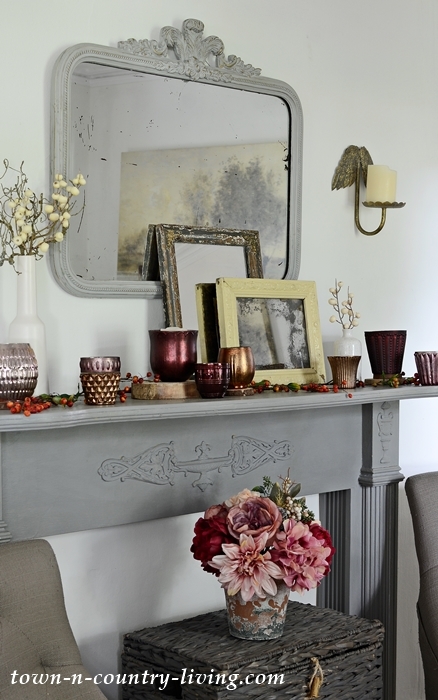 I am inspired to fluff up my old standbys, Mercury glass votive holders, tarnished silver platters, etc. and add a big dose of burgundy and claret colors as you have. Thanks again for sharing your passion and home with us! Hello Jane! Thanks so much for your kind words. 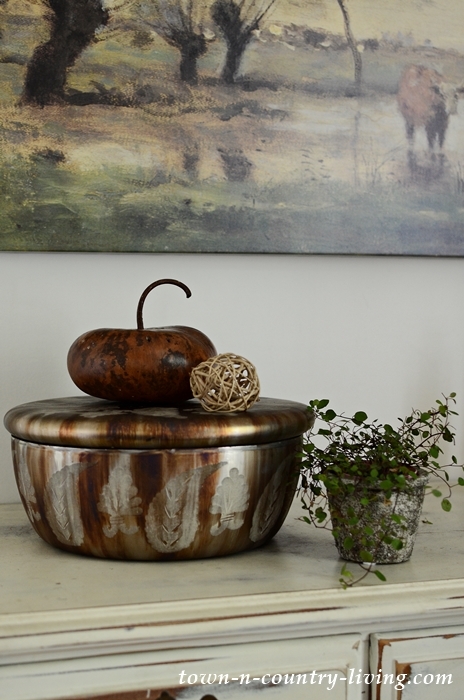 Sounds like you’re on the path to create a beautiful fall home … mercury glass, tarnished silver platters … sounds perfect to me! Beautiful, Jennifer!! 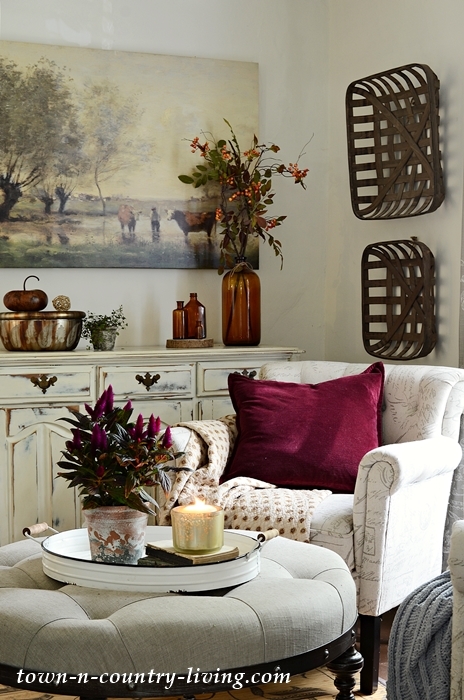 So rich and warm and welcoming – absolutely gorgeous for fall. Glad you could join in on this tour, friend! Wonderful tour Jennifer. It seems anything you put near the pastoral canvas it makes that color pop. I love that and I bought the burgundy pillows you have in Charcoal gray from PB. I have the votive scattered around. I just received the white ones for Christmas. So pretty. All your fall touches are wonderful and neat gourds. 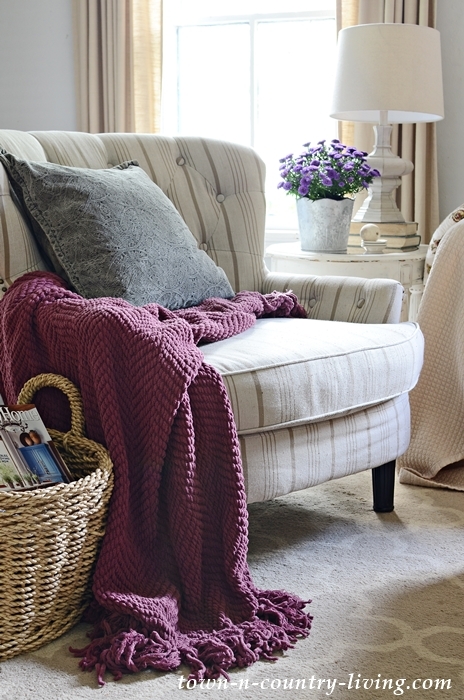 Love this color palette you chose…every touch throughout your home is so beautifully done. 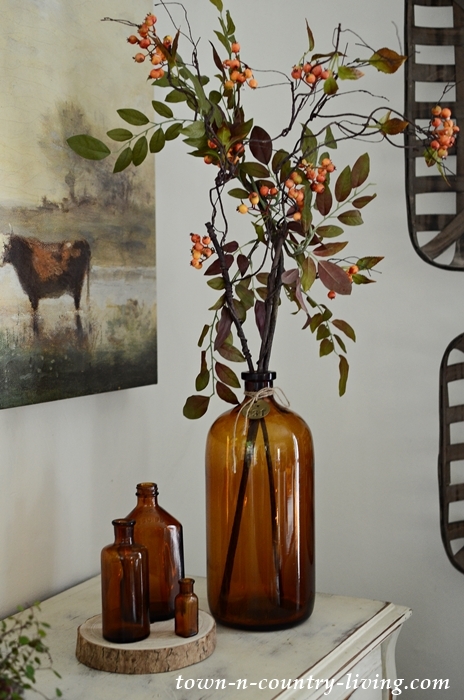 Love your tour, thanks and your home certainly looks ready and welcoming for Fall. Great fall looks. The burgundy touches, along with the browns in the bottles and the artwork, plus the shiny coppers are soooo good together. Who would have thought brown & burgundy would be a thing. You’ve made it amazing. Absolutely love your color palette, Jennifer!! I was actually thinking of doing burgundy this year as the season progresses but with my blush pinks and copper. Love the way you incorporated it with your style and it’s fun with the grey!! Lovely! This is so beautiful, Jennifer! 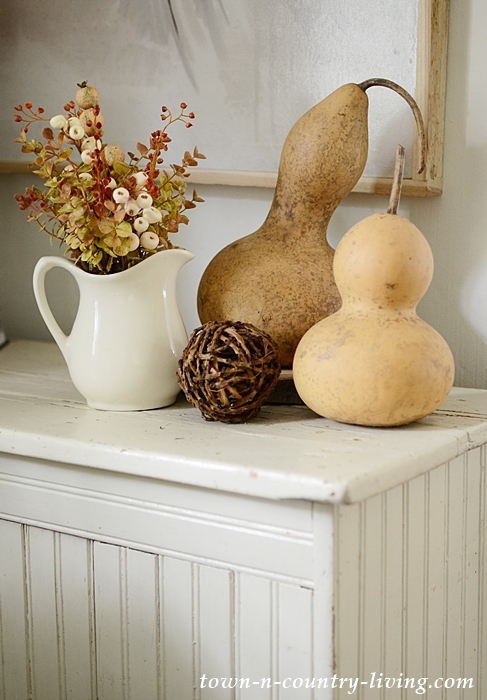 I love all of the warm colors, especially those pretty gourds and that sweet arrangement in the ironstone pitch. Thanks for sharing your cozy home with us! So pretty. 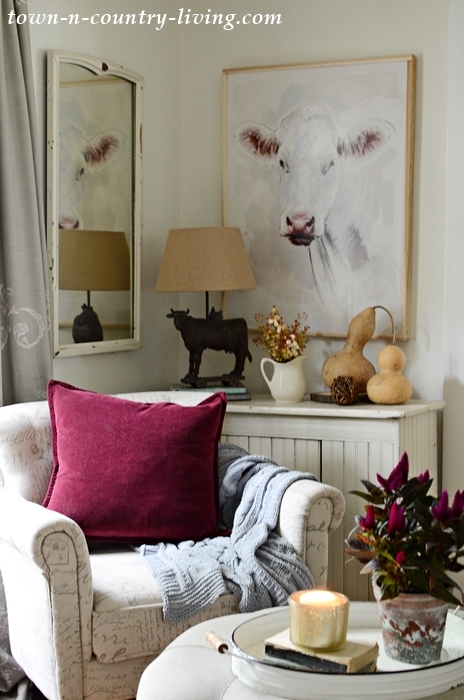 Love the colors and of course I absolutely adore that cow painting. It is always such a favorite. Looks just beautiful, Jennifer! 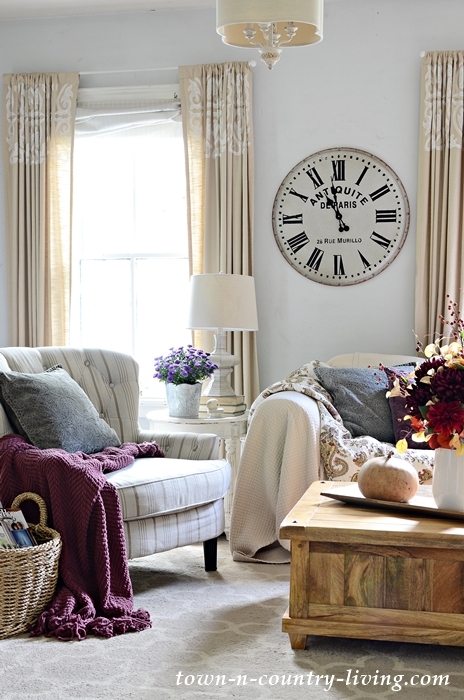 Your styling of your decor makes your home look so cozy and lovely! WOW…. Gorgeous!!!! I love the colors !!!! A bit daring but it worked! 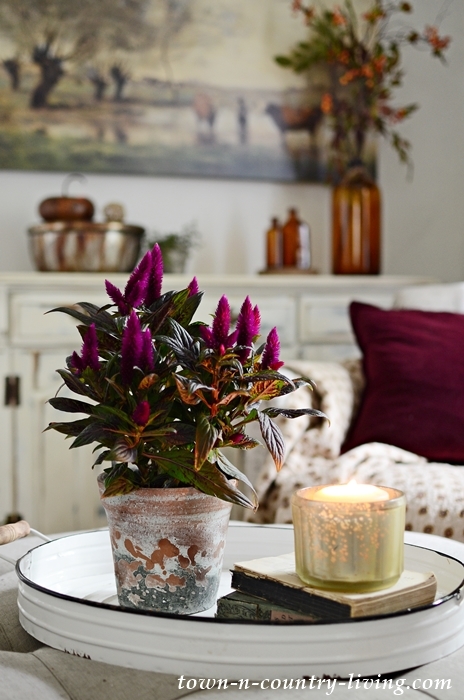 The clarets and purples are beautiful in your home!! 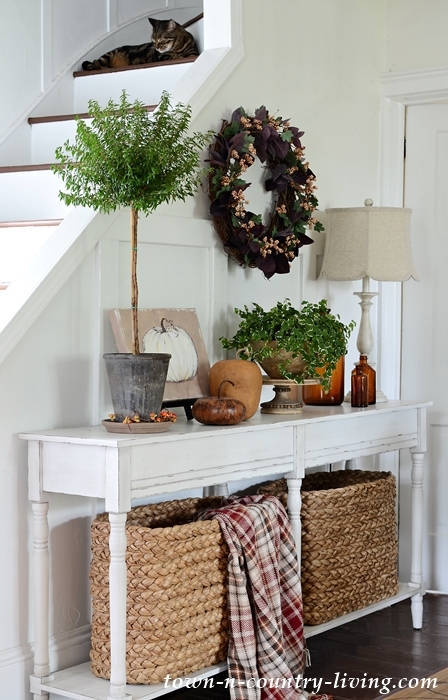 Your home is perfectly style for the fall, love those baskets on the wall. What beautiful rich, fall colors! I see you have several very nice large baskets through out your home. I love big baskets but they all seem so overpriced where I shop. Do you have any good resources to recommend? Absolutely beautiful. What an eye for color and detail. I just found you and your fellow bloggers today. I am amazed at all of your careful choices. I do fall decorating outside, but very little in my house other than a few items. That will change next year.